I’m reaching … and almost there! I am still working on my Reach for the Stars quilt. This is an installment quilt project published in Quilters Newsletter. We are now up to issue 5 of 7 of this installment. The last two issues will have the final two blocks, the setting triangles and center assembly, and then the quilt borders. This has been my favorite quilt so far to work on along with so many others who joined in an impromptu Sew-Along journey. The latest publication included the instructions for Blocks 10, 11 and 12. Here they are! Block 10. I sewed this and found cut corners, so I unpicked a lot of it, tried again and found I had pieced in a section backwards. Unpicked it again and finally got it right the third time. Block 11. Went together easy-peasy. Photo is kind of blurry. I made my own directions to come up with the 8 HST units and four flying geese units. Block 12. This one should have been a no-brainer. But with the opportunity for fussy cutting, I took the longest putting this one together. I have to be honest and say that this is probably my least favorite block. I don’t know why, but I just am not ‘feeling’ it. So… do you want to see how all the blocks look together at this point? I can’t believe I may have this quilt finished this year. I am going to splurge on some custom quilting if Linh agrees to it. So excited to see this one come together. 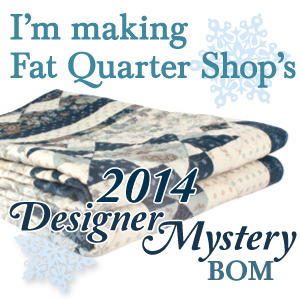 As I mentioned before, and shown on my blog, there are others who are also doing this quilt. Dawn at First Light Designs has done a better job of sharing pictures from our friends. Please visit her website to see her pictures and those of Dawn, Jennifer T, Jennifer V, Sherri C and Colleen. She is showcasing four new blocks from Jennifer V in a post today! Finally, I’ll leave you with a Kitten Centerpiece idea for your dining table. It’s all the rage right now! This is Olaf (girl), Kristoff, Sven, Anna and Elsa (boy). Our five kittens. We named them before we knew if they were girls or boys. No changing vet records now! Have a great, safe, happy and relaxing 4th of July holiday (for those of us in USA). GO COLOMBIA! My favorite now for winning the World Cup. They play on Friday. ← New Trend – Go BIG! “Design bed” — what a concept, LOL! Your blocks looks great, Jennifer! I wonder if your liking-but-not-loving Block 12 has to do with the dark corners and dark sashing? That was what prompted me to change mine. Your cat centerpiece is just too cute! Hi Linda! The Reach for the Stars pattern was published as a 7 part series in Quilters Newsletter magazine, starting with the Oct/Nov 2012 edition. This magazine comes out every two months.